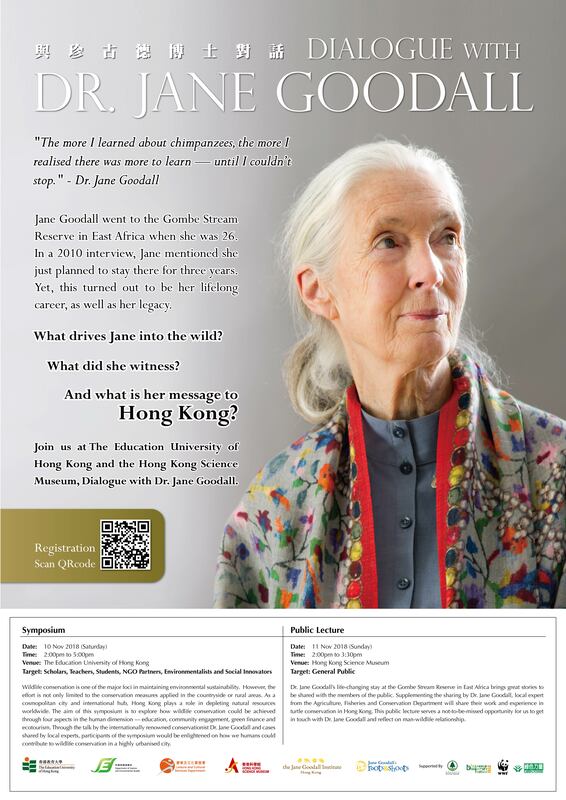 Dr. Jane Goodall will be visiting Hong Kong and delivering public lectures, don’t miss the chance to talk with Dr. Jane Goodall! Location: The Education University of Hong Kong, 10 Lo Ping Road, Tai Po, N.T. Wildlife conservation is one of the major foci in maintaining environmental sustainability. However, the effort is not only limited to the conservation measures applied in the countryside or rural areas. As a cosmopolitan city and international hub, Hong Kong plays a role in depleting natural resources worldwide. The aim of this symposium is to explore how wildlife conservation could be achieved through four aspects in the human dimension — education, community engagement, green finance and ecotourism. Through the talk by the internationally renowned conservationist Dr. Jane Goodall and cases shared by local experts, participants of the symposium would be enlightened on how we humans could contribute to wildlife conservation in a highly urbanised city. Dr. Jane Goodall’s life-changing stay at the Gombe Stream Reserve in East Africa brings great stories to be shared with the members of the public. Supplementing the sharing by Dr. Jane Goodall, local expert from the Agriculture, Fisheries and Conservation Department will share their work and experience in turtle conservation in Hong Kong. This public lecture serves a not-to-be-missed opportunity for us to get in touch with Dr. Jane Goodall and reflect on man-wildlife relationship. Using a story-telling approach, Dr. Jane Goodall will share her experience with chimpanzees at the Gombe Stream Reserve in East Africa. She will also talk about her research and education life, and her intriguing relationship with the chimpanzees. Sea turtles are highly endangered species. Among the five sea turtle species recorded in Hong Kong waters, Green Turtle is the only species known to breed locally. The Agriculture, Fisheries and Conservation Department has been playing an important role in sea turtle conservation. Conservation expert from the department will share their effort in this area of work.